A 47-year-old Nepali mountain guide reached the summit of Mount Everest on Thursday for the 18th time, beating his own record set last year, officials in Kathmandu said. Apa Sherpa reached the 8,850-metre spur of windblown rock at the top of the world’s highest mountain with another Nepali member of his climbing team, according to the Nepal Mountaineering Association. Apa grew up in the foothills of Mount Everest and began his career as a porter, carrying heavy loads up the Himalayan peaks of Nepal. Now a well-paid guide and trek organizer, he first stood on top of Everest in 1989 and has climbed the peak almost every year since then. Dozens of mountaineers have reached the summit of the mountain, known as the “top of the world” in the past few days, after Nepal lifted a ban on expeditions while Chinese climbers took an Olympic torch up their side of the peak. Beijing had been worried about protests during live broadcasts of the torch climb. Nearly 2,500 people have reached the top of Everest since Edmund Hillary of New Zealand and Tenzing Norgay who was born in Nepal first climbed the mountain in 1953. There have been more than 200 deaths from falls, freezing weather and the effects of high altitude. 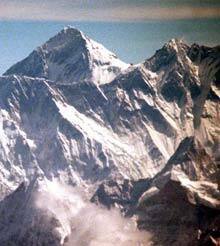 Environmentalists say far too much climbing is allowed on Mount Everest, and the peak is littered with the detritus of expeditions, including oxygen cylinders, abandoned camping gear and human waste. Mount Everest is seen here from the Nepal side of the frontier with Tibet. Apa Sherpa, 47, climbed the world’s highest peak for a record 18th time Thursday.